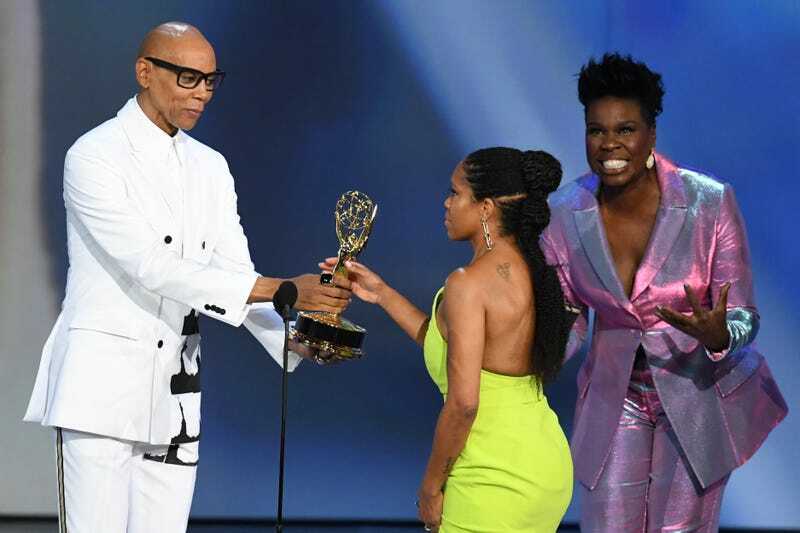 Regina King (c) accepts the Outstanding Lead Actress in a Limited Series or Movie award for ‘Seven Seconds’ from RuPaul (L) and Leslie Jones (R) onstage during the 70th Emmy Awards on September 17, 2018 in Los Angeles, California. The 70th Primetime Emmys opened with several racially charged jokes, talk of diversity and a celebrity-laden musical number called “We Solved It,” touting the most diverse group of nominees in Emmy history. But the joke was still on us, because most of the awards would still go to white nominees. The first winner of color of the night? Regina King, who collected her third statuette for Outstanding Lead Actress in a Limited Series or Movie for Netflix’s Seven Seconds. King, who famously wrote about the lack of diversity at the Emmys in 2010, was genuinely stunned by her win, beating out, among others, the first Asian woman to ever be nominated in the category, Sandra Oh. “Say word,” she said as she began her unprepared acceptance speech. Thandie Newton (L), winner of the award for Outstanding Supporting Actress in a Drama Series for ‘Westworld,’ and Regina King, winner of the award for Outstanding Lead Actress in a Limited Series or Movie for ‘Seven Seconds,’ at HBO Emmys afterparty on September 17, 2018 in Los Angeles, California. In total, only three of Monday night’s 26 awards were handed out to black talent (or any talent of color, actually), bringing a certain irony to the “reparations Emmys” co-host Michael Che handed out to some well-known black television actors in a hilarious skit featuring Marla Gibbs (The Jeffersons), Jimmie Walker (Good Times), Kadeem Hardison (A Different World), Jaleel White (Family Matters), Tichina Arnold (Martin) and John Witherspoon (The Wayans Bros.). Black talent also dominated the acting categories of the Creative Arts Emmys, sweeping the Outstanding Guest Actor and Actress categories in both Comedy and Drama as Katt Williams (Atlanta), Ron Cephas Jones (This Is Us), Tiffany Haddish (Saturday Night Live) and Samira Wiley (The Handmaid’s Tale) all earned honors for their work.